As you can tell from the title, this is one amazing cake. There are so many things to love about it! First, for us, is the toasted marshmallow filling, which is as good as it sounds (partially because it has tiny bits of chewy toasted marshmallow in it). It is so simple…broil some marshmallows and add them and marshmallow fluff to basic buttercream. 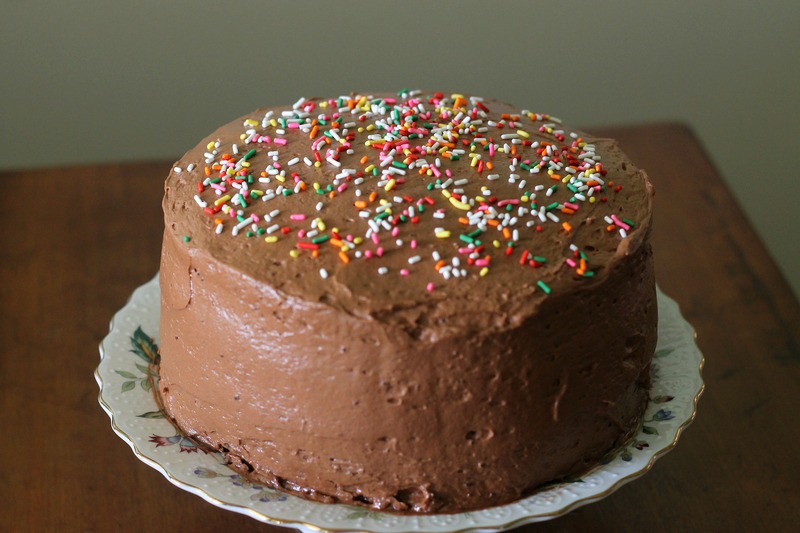 The frosting is malted chocolate frosting, which uses Ovaltine malt powder. Ovaltine has been a classic in our house since we were little, but this was the first time we used it in something other than milk! There is also 1/2 a cup of whipping cream to help make the frosting fluffy, which is a brilliant addition. Instead of beating the butter for a long time, the whipping cream fluffs it up quickly. As for the cake istself, it is a super rich, dark chocolate cake. It actually has 1 1/2 cups of coffee in it, which helps bring out the chocolate flavor. Don’t worry, you can’t taste the coffee in the finished cake. The cake is super moist- not at all dry like some chocolate cakes are. This is one intense cake! Originally we thought the cake layers might be a little too bitter from all the chocolate and coffee, but it works so, so well in this cake. The sweet frostings balance out the rich cake. This cake was for our grandmother’s birthday. She is generous, constantly seeking knowledge, kind, and a big chocolate fan! Also, the frosting is her favorite part of pretty much any cake. What more could you want in a grandmother, right? So of course, we had to make her a cake with lots of chocolate and lots of frosting! This one fit the bill. Despite having lots of frosting, it is not too sweet. It is a rich cake, but not sickeningly sugary like some cakes can be. Pop, we need to make you a better cake next year so you can have your own birthday cake post! As you’ll see above, we have 4 layers while the original recipe had 6. This is because one of our layers stuck to the cooling rack and broke a bit, and then broke even more when we split it later on, so we left out a layer. We just had leftover frosting and cake scraps- not a big problem! We still had plenty of cake for 10 people, with some left over. You may notice that it isn’t decorated so beautifully. Well, we ended up waking up at 9:50 in the morning, and we had to leave for our grandparents’ by 11:00. We had baked the cake the night before but hadn’t made either of the frostings yet. So, in about an hour, we made two frostings, split the cake, decorated it, and got ourselves ready. It didn’t leave much decorating time, but the inside of the cake looks so impressive that a simple exterior works just as well. We will definitely make this cake again! Preheat oven to 350° F. Line with butter, then line bottom with parchment, then butter the parchment, and flour three 8-inch round cake pans. In bowl of electric mixer, sift all dry ingredients together. Combine eggs, buttermilk, coffee, oil and vanilla in a measuring cup and beat briefly with a fork. Add wet mixture to the dry ingredients and beat for 2 minutes on medium speed. Divide batter evenly among prepared pans. Batter will be thin. Bake for 20 minutes and rotate pans in oven. Continue to bake until toothpick or skewer comes almost clean (a few crumbs), about 12 more minutes. Cool on wire racks for 20 minutes then invert onto racks until completely cool. Place marshmallows on baking sheet lined with parchment paper and sprayed with nonstick cooking spray. Place on lower rack of oven, and broil marshmallows until brown on top, somewhere between 30-60 seconds. Remove pan from oven and gently turn the marshmallows over, and broil until they are golden brown. Watch them closely to ensure that they do not burn. In an electric mixer fitted with paddle attachment, combine butter and powdered sugar on low until blended, about 1 minute. Add vanilla and mix on medium-high for about 3 minutes. Add marshmallow cream and toasted marshmallows, and mix on lowest setting for about 1 minute. In a bowl of stand mixer fitted with paddle attachment, combine the powdered sugar and butter and beat on low speed for about 1 minute. Add malt powder, vanilla and salt, and beat on low until combined. Add the melted chocolate and beat on medium speed until smooth, about two minutes. Add whipping cream and beat on medium-high speed for another minute. Use immediately. Split your cake layers. It will be easier if you freeze the layers for about an hour and use a sharp knife. Place the first layer on your cake stand or whatever surface you will be using for assembly. Cover with a layer of the toasted marshmallow frosting and top with another cake layer. Top with chocolate frosting. Repeat until you have six layers. It may be easier to frost the entire cake if you refrigerate it briefly. Evenly frost cake with the chocolate frosting. Serve or store in the refrigerator. Enjoy! Your cake looks absolutely amazing girls! 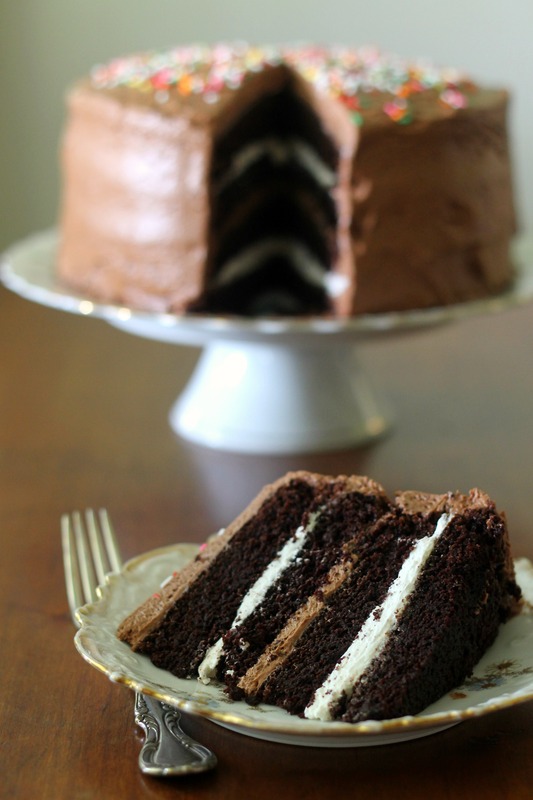 I’ve never used Ovaltine or marshmallow fluff in my baking, but this cake makes me want to try. Thanks you! I think you’ll find the results awesome- when can you go wrong with marshmallow fluff?